Ben Carson tops Donald Trump in new national poll. 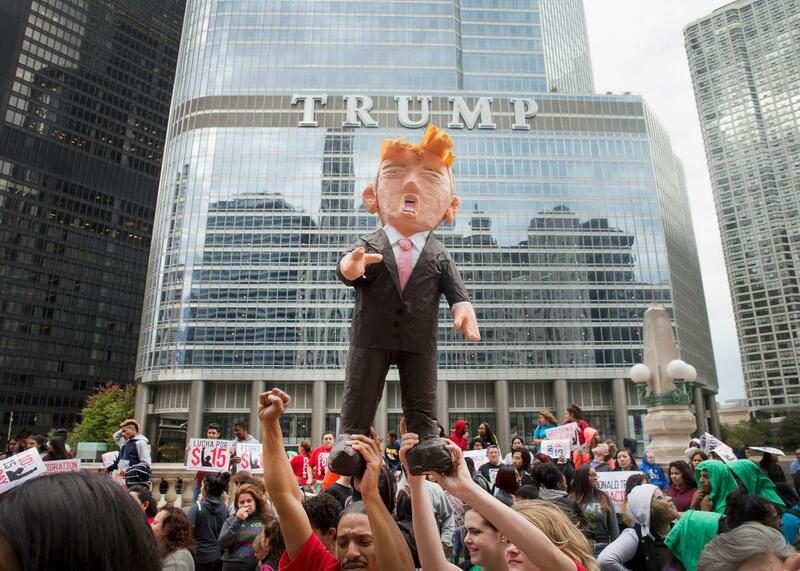 Demonstrators hold up a piñata of Donald Trump during a protest outside Trump Tower on Oct. 12, 2015, in Chicago. Carson’s lead is within the poll’s margin of the error, but it represents the first time he’s led the CBS poll. (Trump’s still up on Carson in RealClearPolitics’ rolling average by about 5 points—though that lead is less than half of what it was last month.) The results comes on the heels of a string of Iowa-specific polls that suggest Carson has taken a clear lead in the state that will kick off the GOP nominating contest early next year. Trump, who has repeatedly used his polling performance to shrug off criticism of his personal style and ignore questions about his policies, reacted to the news about how you would expect—by deciding that polls don’t matter all that much. Generally speaking, Trump—who also noted that he attended a class on polls while getting his MBA at the University of Pennsylvania—is right: Polls tell us about the mood of the electorate today but not what will happen tomorrow. On this date four years ago, after all, Herman Cain was leading eventual nominee Mitt Romney in the national polls. (A month later, Cain would give up the top spot to … Newt Gingrich.) And on this date eight years ago, eventual nominee John McCain was looking up at both Rudy Giuliani and Fred Thompson. Still, Trump’s come-to-statistics moment is a convenient one given that the latest polls are no longer offering him results he can boast about on the stump—and an inconvenient one because it undercuts so much of what he’s been saying for the past three months. If the latest numbers are a harbinger of things to come, then Trump will need to find a new way to justify his political existence on the campaign trail—and, to date, he’s done little to suggest he can.